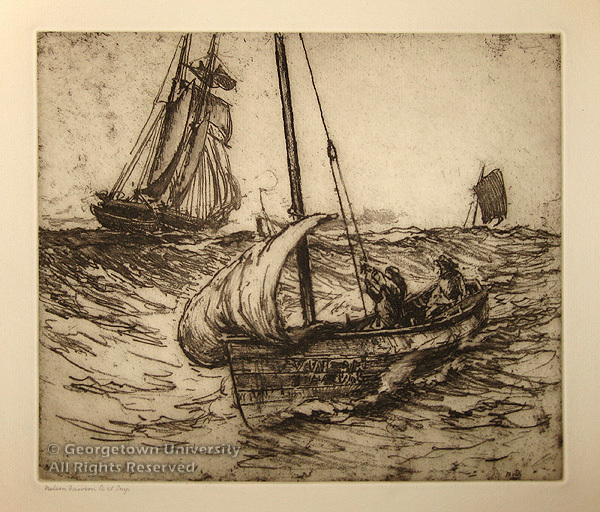 Etched by the Sea celebrates the 150th anniversary of the birth of the British marine artist and fine metal craftsman Nelson Ethelred Dawson (1859 – 1941), who, together with his wife Edith, a talented artist and enameller, were at the forefront of the Arts and Crafts movement in England. For almost two decades, they produced scores of fine metal objects, both utilitarian, architectural, and decorative, including enameled jewelry. 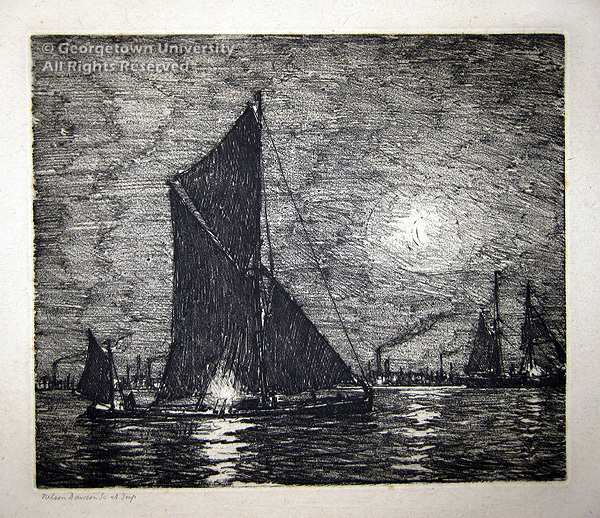 Dawson, who hailed from Stamford in Lincolnshire, trained as an architect but established himself as a painter of marine views in the bohemian London suburb of Chelsea, where he became friends with Whistler, Sir Frank Brangwyn, and other late Victorian artists. 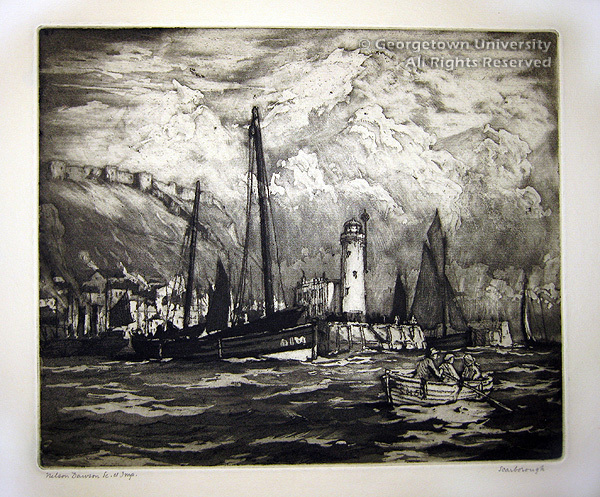 Following the demise of the Dawsons’ metal workshop in 1909, Nelson Dawson devoted himself primarily to creating etched marine views, as represented in this exhibition. 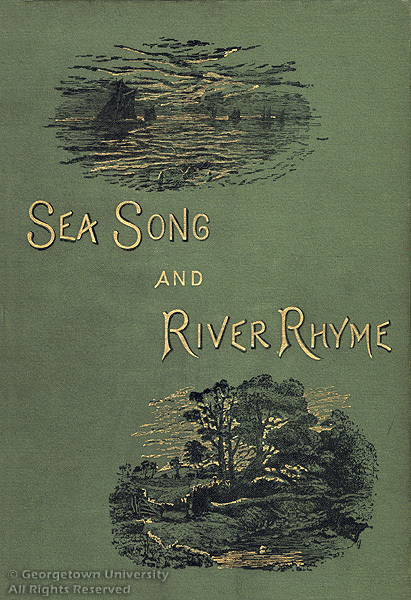 They reveal his profound connection with the sea and something of Dawson’s hero, the master of British marine painting J.M.W. 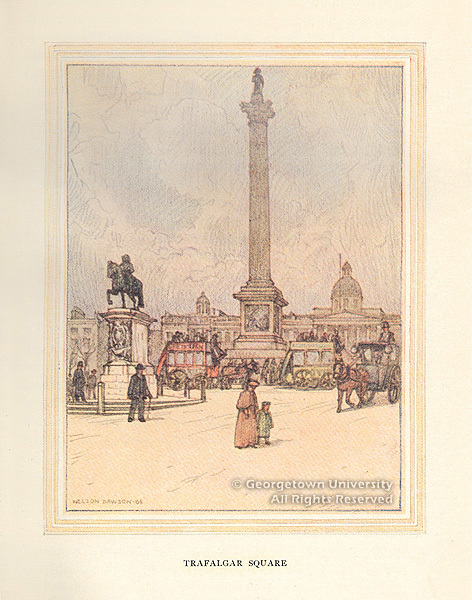 Turner (1775 – 1851), whose popular series of printed views, the Liber Studiorum, was re-published several times in the nineteenth century. 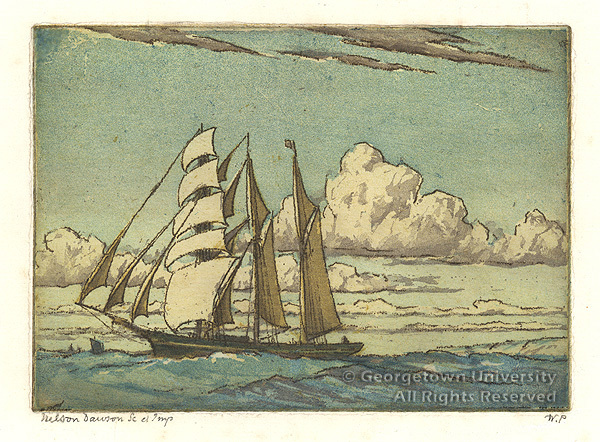 Himself an avid sailor and fisherman, Dawson had a substantial collection of ship models and other marine artifacts, and the family speculated that he was distantly related to and named after the famous British naval admiral. Dawson’s artistic distinctions include associate of the Royal Society of Painters in Watercolors, member of the Royal Society of Painter-etchers and Engravers, and frequent exhibitor at the Royal Academy in London. In 2006 the Stamford Museum honored their native son with a major retrospective exhibition with many works donated by the artist’s daughter. 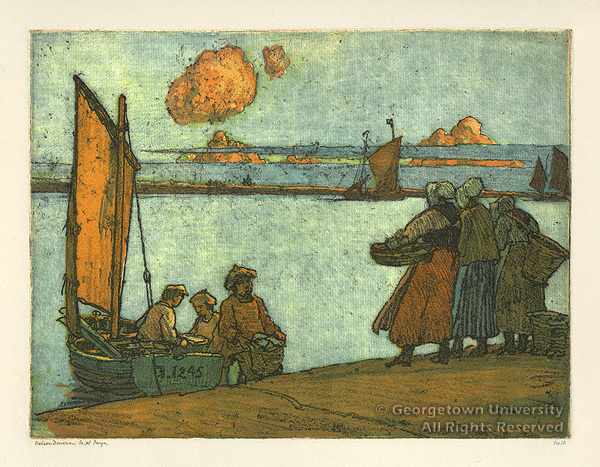 While Georgetown does not own any of Dawson’s metal works, the Special Collections Research Center is honored to maintain more than thirty examples of his printmaking oeuvre. 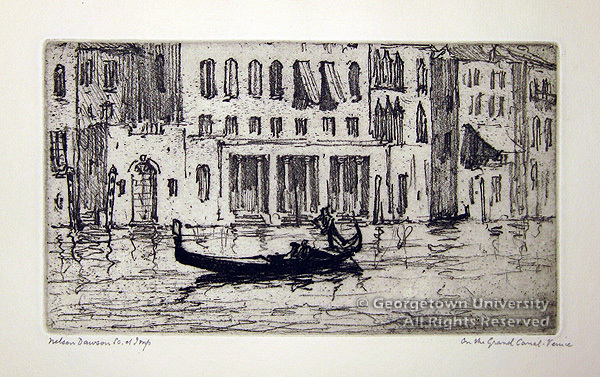 These evocative coastal images of England, France and the ever-resplendent Venice were judiciously selected and acquired by our late Curator Emeritus, Father Joseph A. Haller, S.J., to whose memory this exhibition is respectfully dedicated. 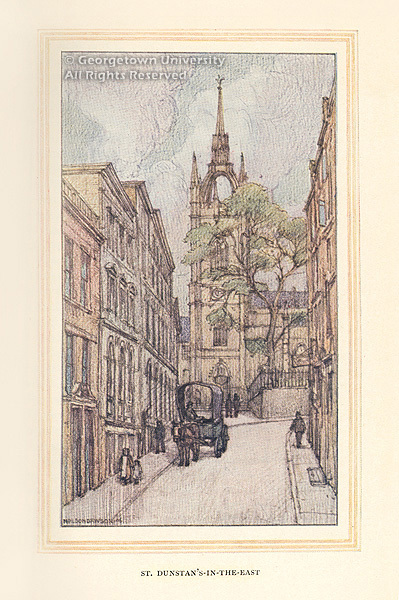 At the height of his career, Dawson and his wife Edith embraced the prevailing ethic popularized by William Morris and John Ruskin, to simplify and refine the applied arts in England while turning to the natural world for design inspiration in their exquisitely wrought, hand-crafted works. This period, known as the Arts and Crafts movement, had its aesthetic parallel in America with artists and designers such as Louis Comfort Tiffany, Frank Lloyd Wright, and Gustav Stickley. Working in everything from wrought iron to steel, gold, silver, and enamel, the Dawsons produced fine metal handcrafts, both utilitarian and decorative, including enameled jewelry. Edith did most of the enameling, while her husband often provided the designs and initial drawings for the objects. 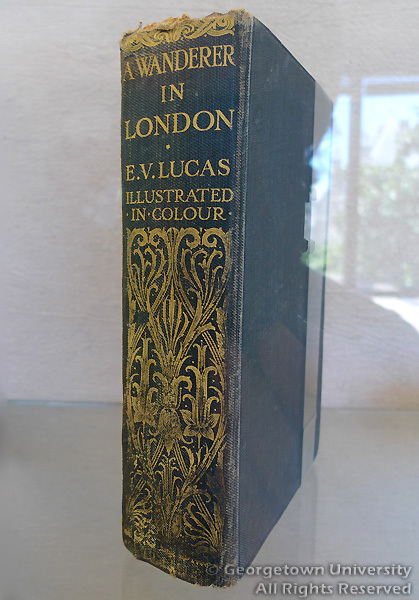 The popular Studio arts magazine of London printed an article on their work in 1897, and in 1905 they exhibited together with the renowned French firm of Lalique. 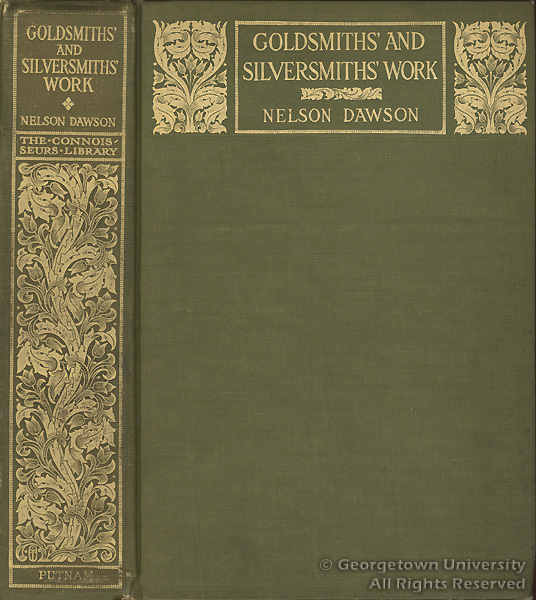 Two years later, Methuen published Nelson Dawson’s thoroughly researched Goldsmiths’ and Silversmiths’ Work, a survey of metalwork through history. 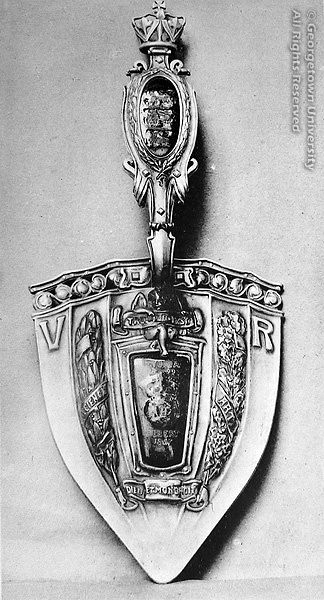 Beginning with Mycenaean and Etruscan arts, it concluded with examples of his own work, including the silver and enamel trowel used by Queen Victoria in laying the foundation stone of the Victoria and Albert Museum in 1899. 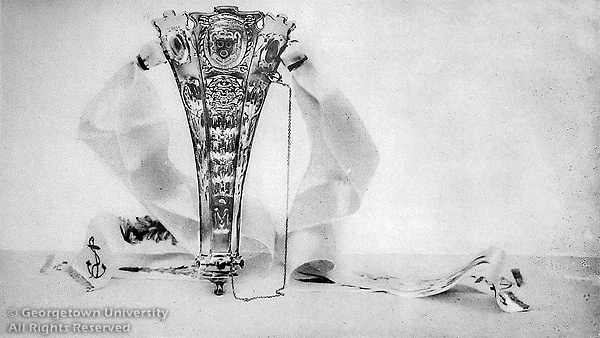 Both objects were made by Edith and Nelson Dawson. 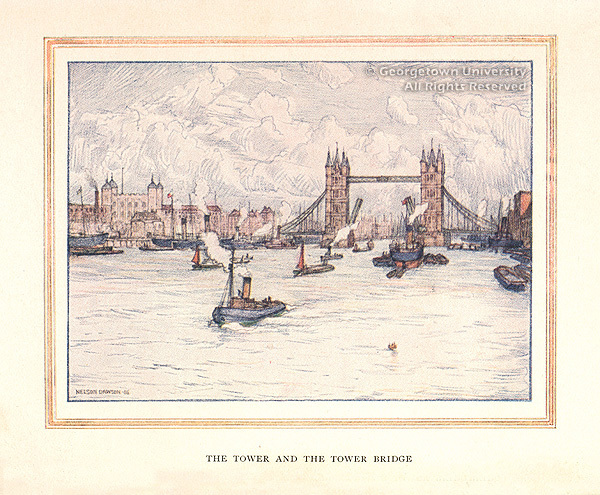 This popular London travelogue was illustrated with 16 crayon drawings by Dawson (selection below). 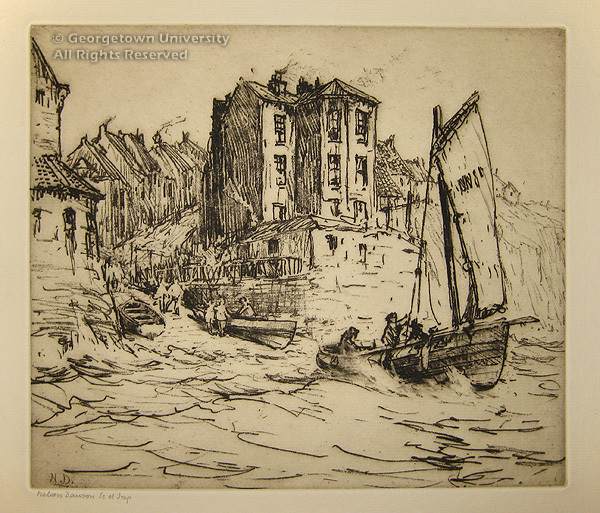 Fishing villages of the northeast coast of England were, until relatively recently, isolated communities accessible only by sea. 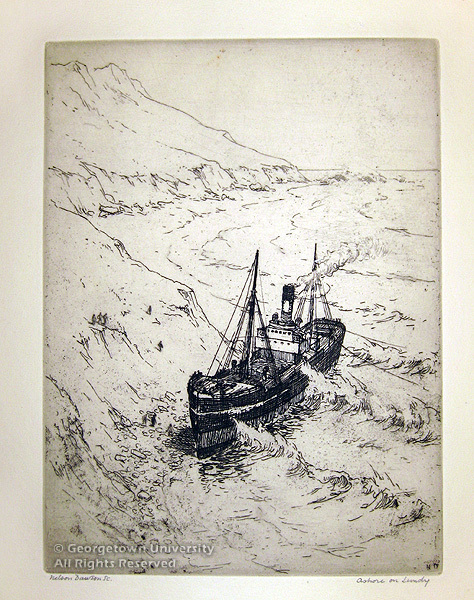 The North Sea provided first whale oil, then herring, cod, and mackerel to family-owned fleets of small, agile ships. 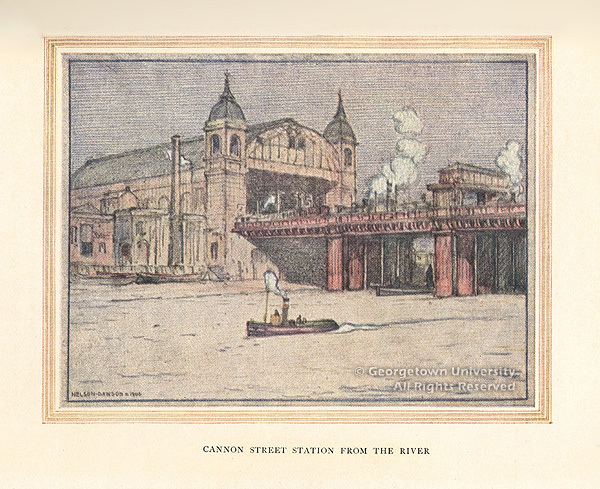 Increasing demand for fresh white fish drove the expansion of railways from the inland areas to the coast towards the end of the nineteenth century; at this time tourism began to develop as a major industry. At the time Dawson was living and working on the Yorkshire coast, larger and more powerful steam trawlers were replacing the sailing boats which had been built and launched from local ports since the early seventeenth century. Enchanted by sailors and local fishing families, Dawson was documenting a vanishing way of life. 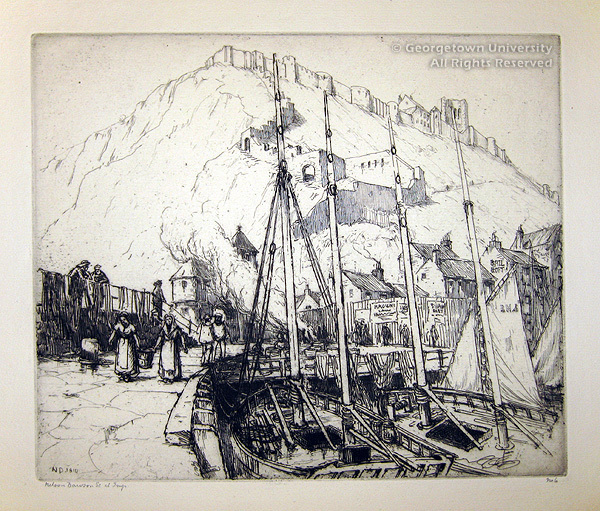 Scarborough's 12th-century castle, keep, and curtain wall were built on a natural promontory where earlier had stood a fourth-century Roman signal station and then a tenth-century Viking fort. The castle was heavily bombed by the Germans during both world wars, causing British outrage in both cases because though the castle is a heritage site, German command treated it as a military installation. The sound of industry on its strand, is music to the ear of every true Briton! The noise of the caulking mallet, the axe, and the saw, proclaim the useful labours of the place; … visitors of distinction [are] entertained by the delightfully busy, and picturesque scene! 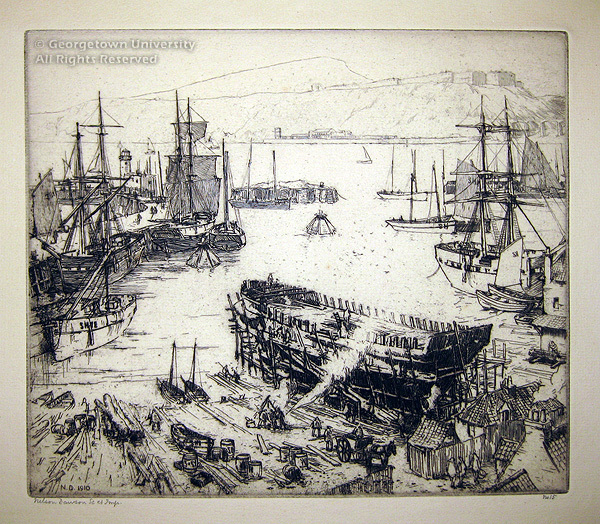 This etching commemorates an era already past when Dawson visited and created there; as new steel-hulled ships became available, shipbuilding in Scarborough declined and eventually completely ceased in 1862. 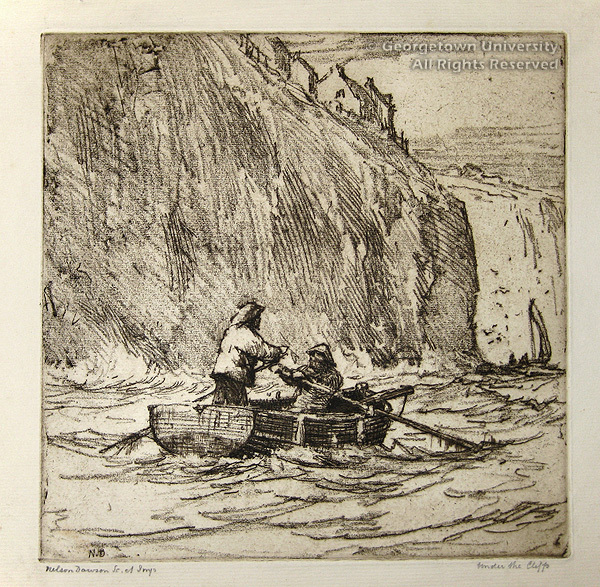 The figural scenes shown here, created when Dawson visited the small fishing port of Éaples, near Boulogne, represent a foray into the technique of color etching, combining his affinity for watercolor with these timeless images of a French fishing community. 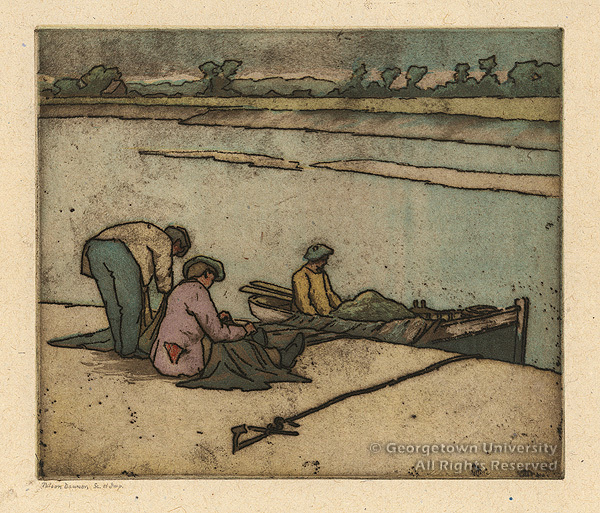 Situated at the mouth of the Canche river, and just 4.5 kilometers beyond the Straits of Dover, the fishing port of Étaples has long been a magnet for artists, especially leading up to the First World War. It was already popular in the nineteenth century, when Impressionist painters such as Eugène Boudin (1824-1898) were drawn by the special quality of the light along the Côte d’Opale. The Halle aux Poissons (or fisherman’s hall) below was constructed in 1874 and is still intact, but has since been converted into a maritime museum. 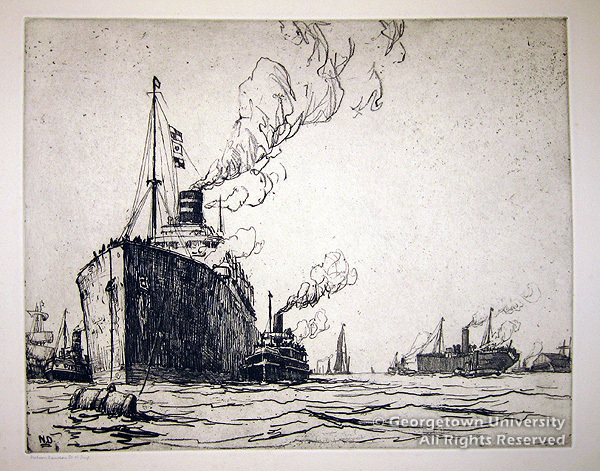 During the years prior to World War I, Dawson became more involved with etching and made several trips abroad. 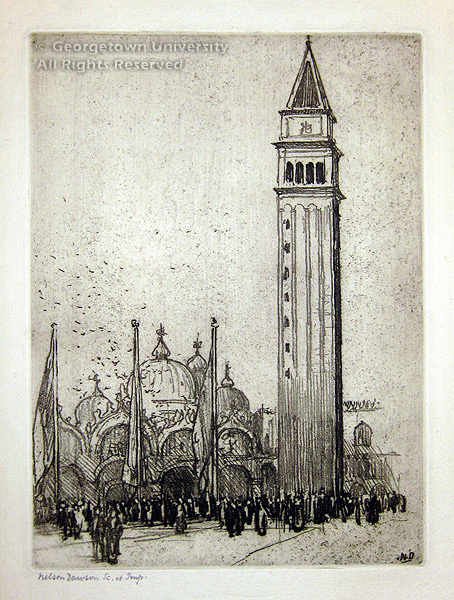 Perhaps inspired by his famous Chelsea friend and neighbor, James McNeill Whistler, Dawson lived in Venice from 1914-15. 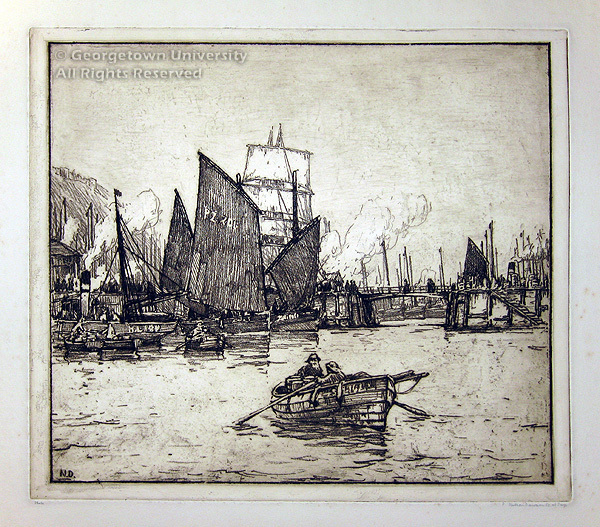 The influence of Whistler’s two suites of Venetian etchings, completed in 1880 and 1883 and widely reproduced in art magazines in subsequent years, is evident in these scenes by Dawson, especially in Venetian Hay Boat. 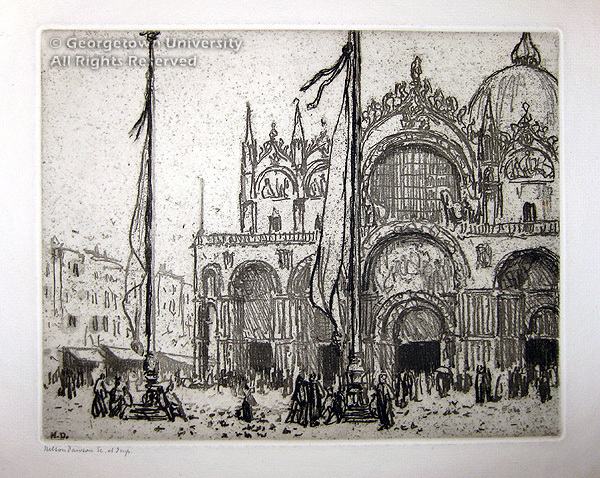 In each of his evocative etchings of the Serene Republic, one can see Dawson’s skill as an architectural draftsman combined with the rapid, sketchy technique popularized by Whistler. 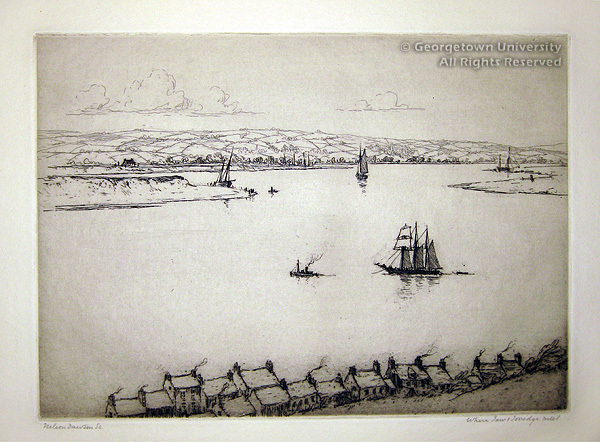 Softground Technique: As an etcher, Dawson preferred the soft ground medium, which produces the effect of a soft crayon drawing. 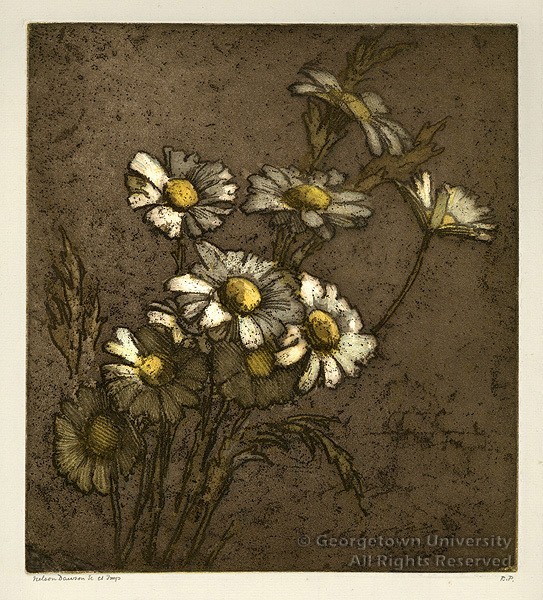 By adding tallow (or grease) to the etching ground on a copper plate, the substance remains in a semi-hard or tacky condition. 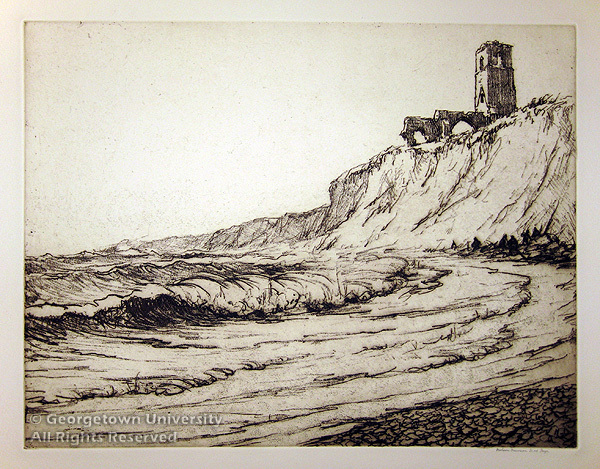 A paper is placed over the plate and the image is drawn with a pencil or other pointed device. When the paper is lifted off the plate, the ground sticks to the drawn lines on the paper, exposing them on the copper. Then the plate is submerged in acid, which bites into the lines, and the plate is then inked and printed. 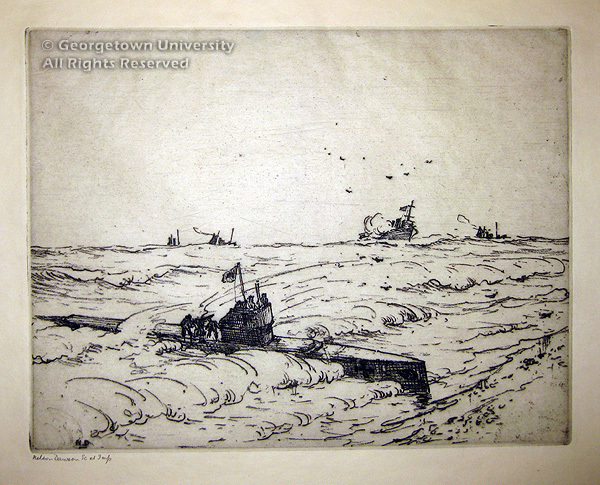 German accounts of this 1917 event state that during midnight operations, submarine U-48 ran aground on the dangerous Goodwin Sands and was found the next dawn by destroyer HMS Gypsy and several armed drifters. 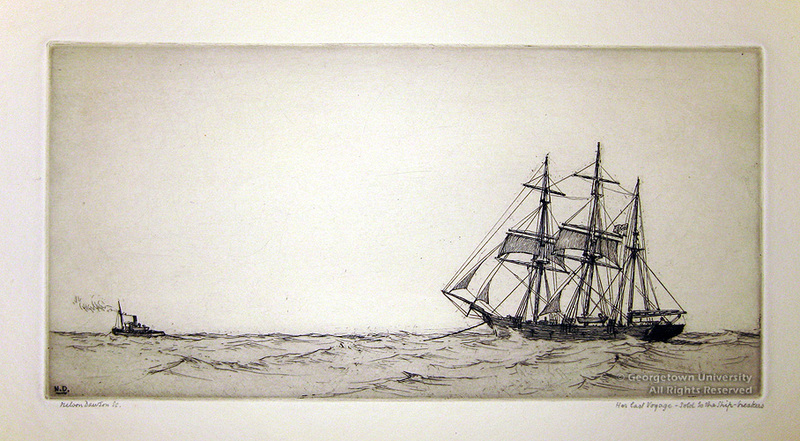 The title Dawson gives his etching gives the British ships a less opportunistic and more actively defensive role. 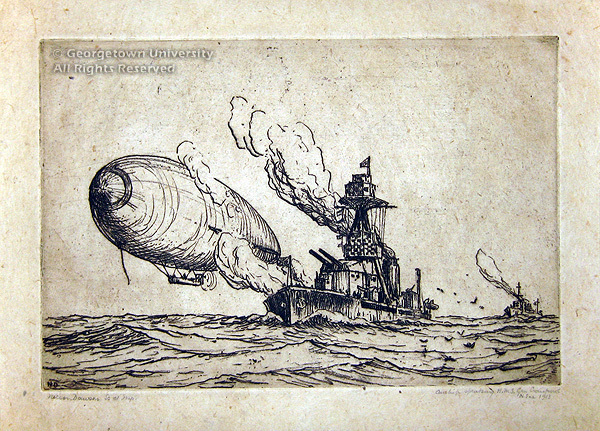 This etching likely depicts the arrival of the airship PL 18/Parseval No. 4, purchased from Germany in 1912 and delivered to the English Navy in 1913. Fear of German airships was widespread at this time leading up to the outbreak of war, and the British populace was anxious for its nation’s military to catch up with Germany in this technology. Contemporary newspapers published many letters to the editor calling for the government to begin producing airships. 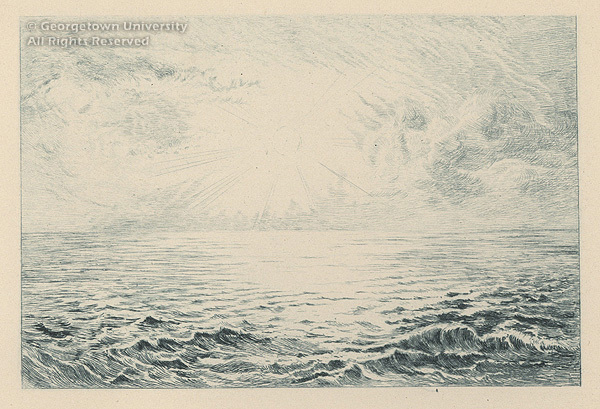 1913 also saw a rash of panicked reports from British citizens claiming to see German airships spying at night. The reports were investigated and officially denied by the governments of Great Britain and Germany. The General Crawford was a Monitor-class ship, a type of ship designed to give close support to troops ashore. During World War I it partnered with airships in patrolling the coastal areas and river mouths, where its shallow draft was an advantage.